From the outside fire damage seems minimal, but the damage caused is 'gruesome,' says local assemblyman. A “suspicious” fire damaged a Catholic church in Boyle Heights that also serves as a center for community activism this morning, and an investigation is underway to find the cause. Flames were reported at 2:05 a.m. at Resurrection Church, located at 3345 E. Opal St. in Boyle Heights. No one was injured, according to fire officials. The multi-agency House of Worship Task Force has been called in to investigate. Two religious statues outside Resurrection were vandalized. One was toppled over. On the other, the face of Jesus was splattered with bright green paint. The task force, with members from several law enforcement agencies, has been investigating a rash of suspicious church fires, including a Jan. 13 fire in Pasadena that damaged the Church of the Angels, a 129-year-old Episcopalian church at 1100 N. Avenue 64. That non-injury blaze, which broke out at 2:20 a.m., is also considered suspicious but to date has not been classified as a hate crime, according to Lisa Dederian of the Pasadena Fire Department. The fire at Resurrection was primarily centered on the first floor of the church, and the flames were kept from the main sanctuary, said Los Angeles Fire Department Capt. Erik Scott. It took 62 firefighters 26 minutes to douse the fire, according to Margaret Stewart with the fire department. Firefighters were conducting extensive salvage operations and water removal during the early morning hours, Stewart said. Due to the vandalism, the fire has been deemed suspicious, Scott said. This newspaper has often referred to Resurrection Church, which includes an elementary school and headquarters for the local Neighborhood Watch — a group that does much more than keep an eye out for crime — as “ground zero” in the battle against environmental injustice and other social justice issues plaguing the working class community of Boyle Heights. Most recently, church members led the fight to shutter the polluting Exide plant in Vernon and to force the cleanup of thousands of homes, schools and parks contaminated with lead from the factory. That history caused an immediate outpouring of concern from the community and elected officials. 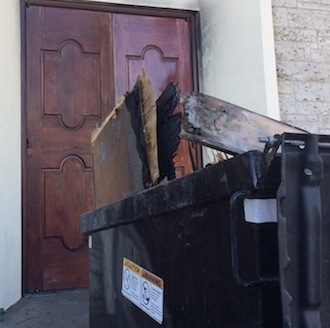 Assemblyman Miguel Santiago (D-Los Angeles) said he and his family regularly attends the church and he heard the “heartbreaking news” about the “fire and vandalism” when he awoke this morning. “I pledge to do everything in my power to assist law enforcement in hunting down the perpetrators of this crime,” said Santiago in a statement released earlier today. Los Angeles Councilman Jose Huizar (CD-14) said he met with the church’s pastor, Monsignor John Moretta, early this morning. Huizar said he was fully briefed by LAPD and LAFD inspectors. “What I can share for now is the LAPD and LAFD investigators assured me that they will do everything in their power to get to the bottom of what caused the fire,” said Huizar, explaining he could not be more specific because there’s an ongoing investigation. “I assured Monsignor Moretta that we will do everything in our power to help them rebuild and come back stronger than ever,” Huizar said in a press statement. According to Moretta, the fire damaged the Church’s vestibule, but firefighters were able to keep it from spreading. The fire was in an area known as the “candle-room,” where worshippers light candles as part of their prayers for special intentions, such as the recovery of someone who is ill or in thanks for something good that has happened. Candles were burning that night, but, according to fire officials, the candles are specially designed to burn slowly and safely. “They can burn overnight, that’s per fire code, so we’re looking for other potential causes,” said Capt. Scott. The situation, though devastating, could have been much worse. “We were lucky, some of our neighbors were out at that hour and saw the fire and called it in,” Moretta told EGP Thursday. Billy Gordon told CBS2 News that he saw smoke and flames coming from the church and called 911. A section of Opal Street was cordoned off for hours as fire fighters mopped up the scene and the Worship Task Force began its investigation. “I’ve been here [at Resurrection] for 34 years and have never seen anything like this,” Moretta responded when asked if he had any idea who might have started the fire. The task force was combing through the debris, going inch by inch through charred and wood soaked remains searching for evidence of what caused the early morning blaze, said fire officials. It will take time to repair the damage from the fire, smoke and water, but the church will continue to hold services, either outdoors or the in parish hall, Moretta said. “We had weddings and baptisms scheduled for this weekend,” he said. “We’ve been working all day on making alternate arrangements,” he said, telling EGP he’d been up since 2:00 a.m. The church is all closed up. From the outside, the damage seems minimal: a narrow section of windows blackened by smoke; the front doors charred around the edges; a dumpster filled with water damaged remains from the interior. It’s much worse than it appears, Santiago said after touring some of the damage. “It’s devastating to see … the damage from the fire and the water,” he told EGP. “It’s gruesome and cruel,” he said, again promising to do anything he can to help the church. While every fire takes its toll, the fire at Resurrection Church is especially troublesome to the people who seek not only spiritual guidance there, but also the many social services offered to parishioners and non-parishioners alike. Parishioner Sylvia Manzano says the fire has shaken her. “It’s very, very awful, I feel nervous, I feel angry,” Manzano told CBS 2 reporter Kandiss Crone. “Who would do something like this,” asked Ramon in Spanish, not wanting to give his last name because he’s in the country without permission. “This church, father, they do go things, they don’t hurt anyone,” he said, shaking his head in disgust and disbelief. “This is a disgrace. You have to be mentally ill or full of hate to attack a church, to throw paint on Jesus,” Ramon said.